Choosing the right skis for you. Why not give something new a try? Thinking of buying your first set of skis in time for this year’s ski holiday? Maybe you’re going to rent but decided you want to give something new a try? Or, perhaps you’re envisioning becoming the next global freestyle skiing sensation and need to start off with the right tools. Whatever the reason, finding the right skis to suit you and your style will make your next ski holiday unforgettable. Plus, our all-inclusive ski deals come with ski hire or carriage included, saving you time and money whatever you’re planning to do. Camber is the amount of upward arch away from the snow a ski has from end to end. When you bend the ski in each turn, camber is what pushes you back. The opposite of Camber, quite literally, is Rocker. Rocker is the arching of the ski towards the snow (imagine camber upside down). Rocker helps to create flotation in deeper snow. As the amount of Rocker in a ski increases, it’s important to remember you get less effective edge on hard snow. This means a heavily Rockered ski may feel like a shorter length when skiing on piste, so you might want to size up in length accordingly. The stiffness of a ski has a big effect on the way it handles and what it’s good at. As a rule of thumb, the stiffer a ski is the more stable and predictable it will be. On the other hand, softer skis will tend to be more forgiving, easier to ski but less supportive in certain situations. 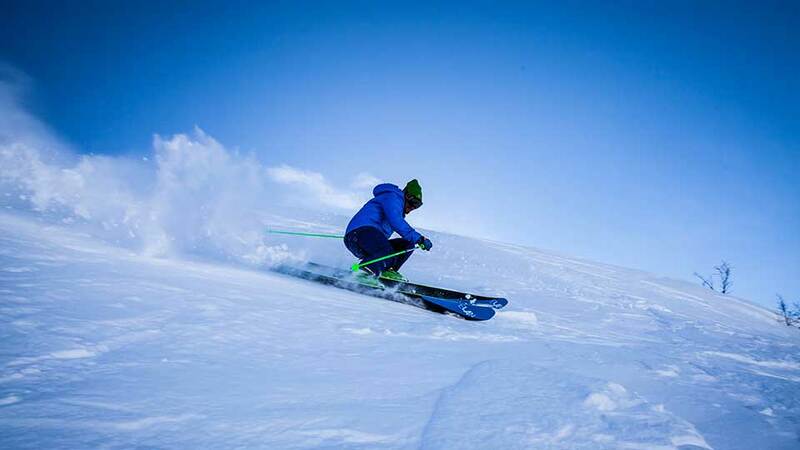 Softer tips in skis will allow you to plane up and sit on top of softer snow. When looking down at a ski you’ll notice it’s wider at the tip and tail, and thinner to a varying degree in the middle. Sidecut enables you to turn, by laying the ski over onto its side and carving the edge into the snow. The sidecut radius of a ski refers to the radius of a circle the ski would create if it continued to travel all the way round in a turn. The lower the sidecut radius the more agile and easy to pivot the skis will be. Waist width is also important, and no we aren’t being rude! Waist width is the measurement (usually in mm) of the thinnest part of the ski, or where the sidecut is deepest. 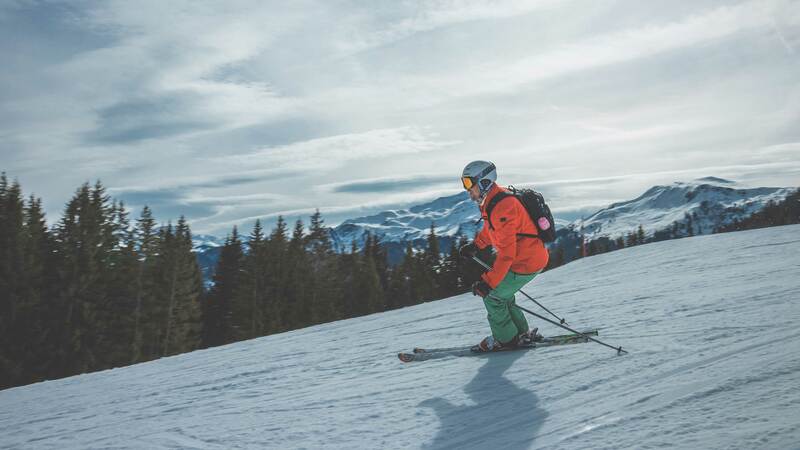 Skis are designed for individual characteristics and suitability to different types of snow by altering these factors until the right balance is found. Skis designed to help you make smooth arching, carve turns on the corduroy. They are likely to be at the stiffer end of the scale to help with high-speed stability, and the tip to tail camber will really help you pop from one turn into the next. These skis won’t be so fun anywhere other than the piste so explore the other categories if you’re thinking about leaving the groomed runs. Camber / Rocker profile: Camber under the boot in the middle of the ski. Rocker in the tip, sometimes in the tail. Stiffness: Still fairly stiff underfoot in the cambered section, getting progressively softer moving towards the tip and tail. 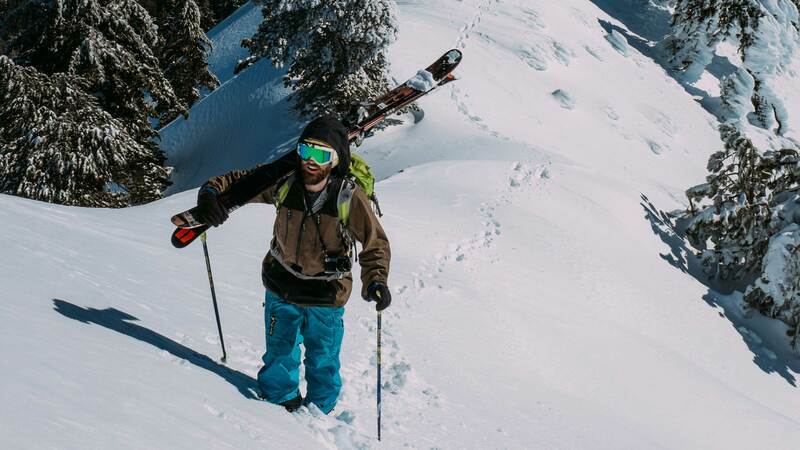 These skis are not intended to be the best at any particular type of terrain, but rather to give you versatility across the range of conditions you could find out on the mountain. When looking in the all-mountain category think back to what makes a ski. More rocker and width; will help you float in deep snow but will be less effective on the piste. More camber and less width will be great on piste but will sink in deeper snow. As you can see adding Rocker means less effective edge so you may find a longer length than usual works better for you. Camber / Rocker profile: Minimal camber if any and lots of tip and tail rocker. Stiffness: Variable from moderate to softer depending on the intended use. Aimed primarily at doing one thing and one thing only; keeping you afloat in the deep stuff. Just like a surfboard floats on water the floatation created by wider waist widths in this category will help you cruise on top of the powder, while the large amounts of tip and tail rocker will keep the tips and tails loose for smooth, surf-like turns. Stiffness: Anywhere from max stiffness to full noodle depending on the use. Sidecut: Range from the thinnest short radius sidecut to the fattest and longest. Most freestyle skis share the similarity of being twin tipped, meaning the tips and tails are the same with the rider mounted close to the very centre. This allows for skiing backwards (skiing switch) with the same characteristics as going forwards. This twin tipped symmetrical shape can come in all different combinations of camber, rocker, stiffness and width. 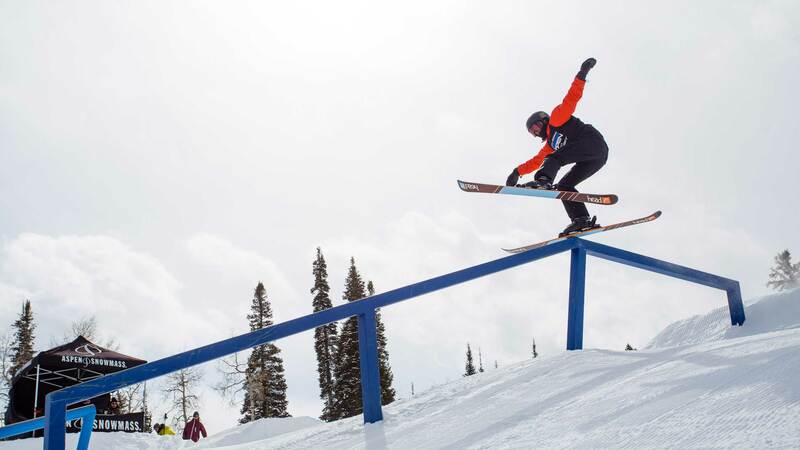 Narrower and stiffer twin tip skis are best for big park jumps and rails, providing maximum stability. Wider twin tip skis with more rocker become more playful, allowing for different tricks and the ability to ski switch more easily in deep snow. People usually assume that branching out to different types of ski is something they should only consider as their ability increases. While this is somewhat true for very specific use skis, like freestyle or powder for example, it is important to remember that modern ski design is intended to help, not hinder you. Don’t be afraid to try a wider ski or a ski with some more rocker perhaps than you are used to. Trying a new ski profile could help your skiing progress and actually help you have a lot more fun in the process. Our ski equipment hire page contains more information on the different grades of ski hire available. These are Bronze, Silver, Gold and Platinum. Moving up the grades increases the amount of choice you have as well as the range of different types of ski available. Choosing Gold or above is a great idea for those looking to try everything the mountain has to offer, as you can change your skis during the week, adapting to different snow conditions. At Skiworld we have an allocation for winter sports equipment on every flight, allowing you to bring your own favourite skis or snowboard with you. These spaces are limited however so booking early is important to avoid disappointment. Please call our Ski Specialists on 0330 102 8004 if you would like to add ski carriage to your booking. 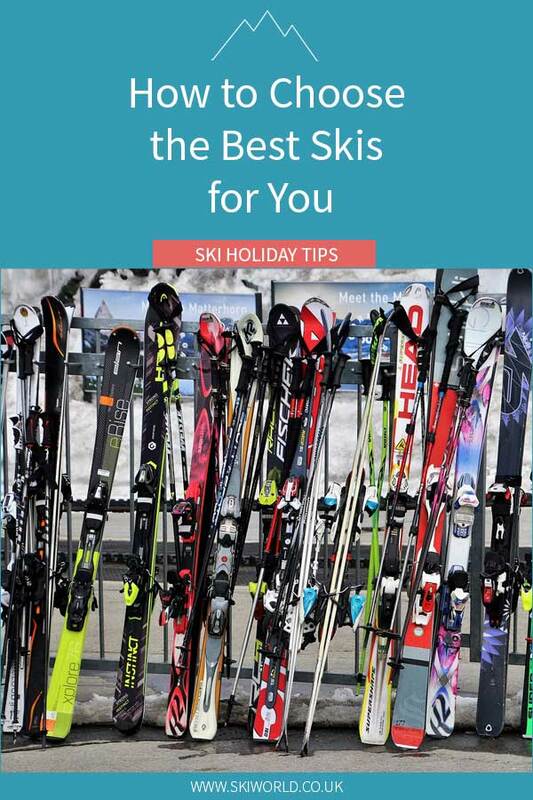 Share the post "How to Choose the Best Skis for You"